81 Renfield Street, Glasgow. G2. Tel: 01413532807. To read more on the history of this pub click here. This city centre pub has 21 years remaining on the lease. An asking price of offers over £39,000. September 2005. During the 1970s and 80s this pub was called McArthur Park. 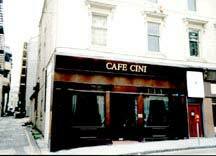 Many will also remember this trendy pub as Targets. Glasgow's latest lounge bar is scoring a direct hit with all its customers. That's not really surprising, since it's called Targets Bar. 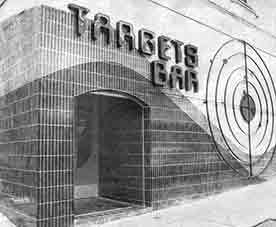 It's not hard to see where Targets Bar gets its name. Beside the front entrance door in Renfield Street is a huge rifle target, guaranteed to stop most passers-by. And the interior is just as unusual... one wall has another huge rifle target on it. In charge of Targets' decor was Mr Eric Cadenhead, whose company are architects and interior designers. It was he who decided on the target theme for the new lounge bar and he chose the modern and extremely attractive colour scheme of reds and mauve. As well as selling "normal" drinks Targets also serve cocktails with exotic names like Tequila Sunrise, Moscow Mule and believe it or not, Believe It Or Not, a mixture of Vodka, Apricot Brandy and Grand Marnier. At the moment there is no live music in Targets, but there is background music to help soothe those ragged nerves you've cultivated during a day's hard slog at work. Bar snacks are available at lunchtimes. The subdued lighting lends itself to a sophisticated atmosphere. But because of its position, almost opposite two cinemas, it is also a great place to pop into for a pre-movie tipple. 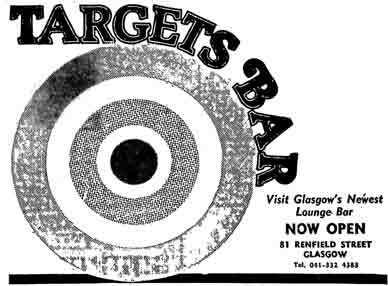 Targets Bar is open six days a week from 11-2.30 p.m. and from 5-11 at night. Another name this bar had was Scrupples, and the Picador. This popular bar is now called The Bay Horse, 2012. 1973 Matilda Blair Young MacFadyen.